Neighbors don’t know exactly when the building at 6210 S. Fairfield Ave. became abandoned. But by 2009, the two-flat was a hollow wreck, with chunks of the roof littering the rotting wood floor. No one looked after the building with the flat roof and red brick facade. Neither the bank nor the investor who had financed the property wanted to take care of it. Even by generous estimates, the building was worth only about one third of the $229,000 mortgage that was taken out in 2007. It was a typical bank walk-away. A gang claimed the building. Prostitutes slipped in to hide and turn tricks. Gunshots rang out regularly in the alley. Neighbors repeatedly called police and City Hall for help. Then a volunteer from the Inner-City Muslim Action Network, which has an office at the end of the block, found a girl crying next to the building. She had been raped in the gangway in broad daylight. “That, for us, was the tipping point,” says Rami Nashashibi, the organization’s executive director. Two years ago, the city mounted a red X on the front of the building, a sign to firefighters that it wasn’t worth saving. Like a death sentence. But the house would not die. In an unlikely turn of events, a community came together to bring a building, and a neighborhood, back to life. In the six years since the housing market melted down, “foreclosure fatigue” has set in, as one housing researcher puts it. Upper-middle-class white neighborhoods across Chicago have shed the weight of the housing market bust, and homes are being snapped up for prices that rival the market’s peak in 2007. But the recovery has yet to reach pockets like the 6200 block of South Fairfield Avenue—a stretch on the city’s Southwest Side of squat, brick bungalows with a couple of two-flats sprinkled in. Of the 16 houses on the block, only four aren’t next to a vacant property, in foreclosure or worth less than the owner owes on the mortgage. One of them is a rectory. 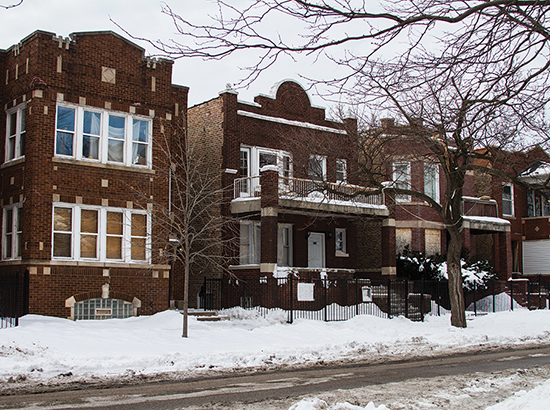 In Chicago alone, there are more than 18,000 vacant single-family homes and apartment buildings clustered mostly on poor or blue-collar blocks. County records show that half of them have likely been empty since at least 2011. More than one-third of the properties are what real estate experts call “zombies” because they exist in a netherworld of accountability between banks and their former owners. The banks have filed foreclosures but haven’t completed the process, which hit a high of 815 days in 2013, according to RealtyTrac, a private real estate research firm. Municipalities across the country and Cook County have filed lawsuits against banks to try to recover the costs of maintaining blighted buildings. Chicago hasn’t. City officials say they’re taking a more targeted approach by pursuing code violations or taking the properties to court. Chicago’s Law Department has opened at least 1,100 housing court cases in the past two years against properties linked to a handful of banks in charge of the bulk of the vacancies. City lawyers helped write tougher laws to hold banks accountable for registering and securing the properties. The goal is twofold: The city has to ensure that the buildings aren’t a public safety hazard and that they are preserved so demolition isn’t the only option. Chicago taxpayers have spent $36 million boarding up and knocking down blighted buildings during the past three years. 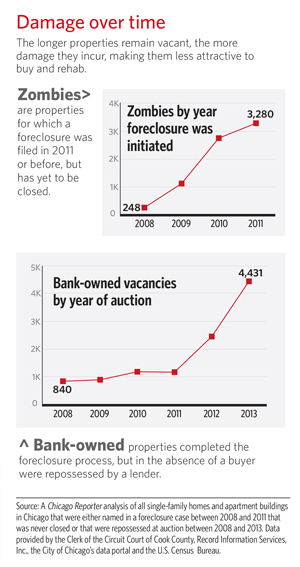 Banks have kicked in very little to clean up the foreclosure mess. The city has recouped only $453,000 toward the cost over that time. Roughly half of the vacant properties are linked to six banks—Bank of New York, US Bank, Bank of America, Wells Fargo, JPMorgan Chase and Deutsche Bank, which was the trustee of the loan on 6210 S. Fairfield Ave. before it was sold to another trust. Each of these banks does business with City Hall. Since the housing market collapsed in 2008, they have managed $1.4 billion worth of taxpayer money as depositories or provided credit or debt services, according to city payment records. The Rev. Anthony Pizzo can see 6210 S. Fairfield Ave. from the window of his study in the rectory of St. Rita of Cascia. Just across the street, the two-flat is a painful reminder of the problems brought on by foreclosure and the decline of a once-thriving neighborhood. During the post-war boom of the 1920s, St. Rita didn’t just anchor the east side of Fairfield Avenue, it was the center of the neighborhood. A growing middle class of white managers and skilled laborers from the nearby stockyards flocked to the tidy one-and-a-half-story brick homes that line the west side of the street. 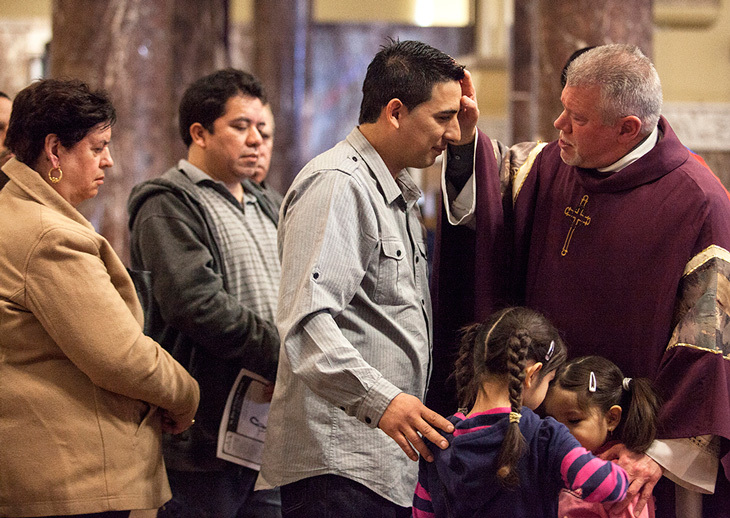 In its heyday, the church, which can hold 2,000 people, was packed on Sundays and there were seven full-time priests assigned to the parish. By the late 1920s, the parish broke ground on a grammar school expansion and it became the largest Catholic grade school in Chicago. By the time Pizzo, or “Father Tony” as he’s better known, was assigned to St. Rita in 2006, subprime lending was at its peak. Nearly six out of 10 mortgages on single-family homes in a swath of the Southwest Side anchored by Chicago Lawn were “high cost.” Interest rates—and payments—were about to jump, the Woodstock Institute, a Chicago-based nonprofit housing research group, reported that year. Local housing activists initially thought the housing market would go through a rough patch until interest rates were readjusted. Instead, unemployment skyrocketed and people with good loans lost their jobs and couldn’t make their mortgage payments. 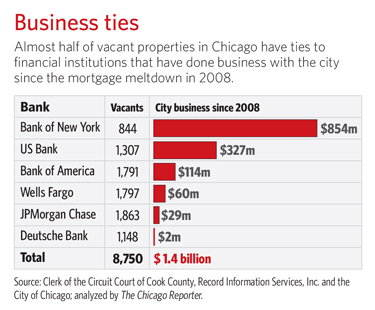 By 2007, Chicago Lawn had become ground zero in the foreclosure crisis. A stretch of Pulaski Road between Interstate 55 and 71st Street—which cuts through similar black and Latino neighborhoods—became known as “Mortgage Street,” named for the brokers who’d set up shop and were continuing to sell loans backed by investor pools, and in some cases, major banks. Pizzo started keeping a map of foreclosures in Chicago Lawn taped to the wall in his office. Hundreds of tiny red dots are clustered in every corner, except an industrial zone and Marquette Park, which covers 323-acres. 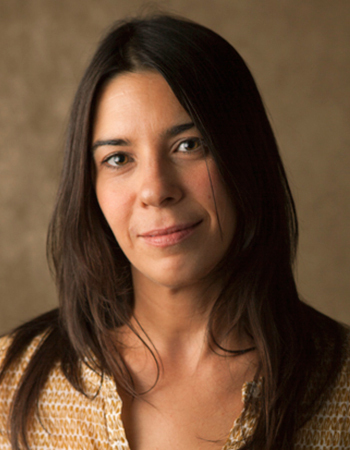 “The first time I saw the map, that’s when I realized it was a disease,” Pizzo says. The two-flat at 6210 S. Fairfield was a daily reminder of the disease that had infected the community. Pizzo thought about photographing the building or sending his maintenance man over to secure it, but he was worried about trespassing on private property. He called Mike Reardon to help him line up a meeting with Deutsche Bank, which initially held the loan on the property. Reardon is the longtime director of the Chicago Lawn office of Neighborhood Housing Services, a nonprofit revitalization organization. “We’re going to have to go to Berlin,” which is where the bank’s headquarters are located, Reardon told him. In 2010, Pizzo and members of the Southwest Organizing Project, an organization with 30 local religious institutions, schools and nonprofit members, including the Inner-City Muslim Action Network, used what he calls their “power in numbers” to help them meet with bankers. They met with former-Mayor Richard M. Daley’s brother, Bill Daley, a vice president at JPMorgan Chase. The following year, community members pressed Bank of America to send a delegation to St. Rita where they tried to appeal to the bankers’ conscience. The community asked for loan modifications to avert more foreclosures and pressed for solutions to reoccupy the homes. By then, the number of empty homes was piling up. Bank of America and JPMorgan Chase pledged to try to do more. But behind the scenes, the financial industry, which has the most lobbyists at City Hall, was working to kill an ordinance that would hold banks accountable for registering and maintaining vacant homes. The banking industry countered that in many cases banks were only servicing the loans on behalf of investors. Since they didn’t hold the title, they shouldn’t be held responsible. The ordinance was adopted in 2011. “The banks crafted their comments so well and they made you feel like you’ve been heard,” Pizzo says. In time, it became obvious that the commitments to do more were empty promises. Andrew Durden stands on the front porch of his yellow-brick two-flat, ticking off the names and addresses of people on the block who’ve gone through foreclosure. The building at 6210 S. Fairfield Ave. was the first one left for dead. A house owned by Jessie Talbert, a woman in her 80s who lived six doors down, is the most recent to go into foreclosure. Last year, Durden, who neighbors call “Drew,” noticed that something was amiss when he saw “Ms. Jessie” cutting her front lawn with a pair of scissors. By his estimate, the grass was 18 inches tall. Then, Durden says, she paused, looked back at him and asked him to cut her lawn. The next thing he knew, he and his wife were cleaning out her house, which was packed with garbage. Durden is a slim 57-year-old whose figure was shaped by his younger days as an all-star tumbler at Carver Park in Altgeld Gardens, the public housing community where President Barack Obama cut his teeth as a community organizer. As an adult, Durden became a booster for the tumbling program, which he credits with teaching him the power of community. “I take care of everything this way,” Durden says pointing south, starting with 6210 S. Fairfield Ave., which was quickly deteriorating when he moved onto the block in 2008. The basement windows were wide open, a car was abandoned in the yard and a neighborhood mechanic started dumping tires and car parts on the property. He called police when he heard gunshots in the alley and when homeless people lit fires in the house to stay warm. “The police kept coming back and back,” Durden says. When a truck full of men arrived one day, Durden was hopeful that someone had bought the building. They turned out to be scrappers—thieves who strip vacant buildings of copper pipes, electrical wires and hardware and sell them. By the time the Inner-City Muslim Action Network turned its attention to the building, the two-flat had been completely stripped. The copper pipes and electrical wires were dug out of the walls. The boiler was gone. The kitchen cabinets, the rear fence and even a toilet were stolen. It didn’t take much to rally people from the block around 6210 S. Fairfield Ave. Pizzo was already calling the alderman because he was a nervous wreck watching children walk past the empty building on their way to school. Other people wanted to help adopt the building as well. Ms. Eva, an elderly woman who lives a few doors down, sent her two foster children to help. They worked with others to till a plot where they grew mint and squash. Their bigger challenge was getting the building noticed beyond the block. Owners and managers are supposed to register vacant properties every six months. But between 2009 and 2013, no one registered 6210 S. Fairfield Ave., and no one was cited for failing to comply. Neighbors called 311 to complain that the front door was wide open. The city paid $526 to have it boarded up, but there were no building-code violations issued after that. Taking the building to housing court seemed like the best way to “smoke out” the owners’ identity, Nashashibi says. By that time, Deutsche Bank had sold the property to an elusive trust. Each time the case came up, a delegation of neighbors—including some who were dealing with their own foreclosure drama—went to court. “We were able to show that we are serious about this building,” Nashashibi says. The new owners never stepped forward, and within months, the city claimed the property and named an arm of Neighborhood Housing Services as the caregiver. The Inner-City Muslim Action Network bought it last August, nearly two years after the housing court case was filed. An investor from Qatar put up some money to help rebuild. Within a month, the organization hired a group of workers, including Levie Jackson, to rehab 6210 S. Fairfield Ave. through its reentry program for returning prisoners. The 40-year-old had just been released from prison after serving 20 years for a murder conviction. 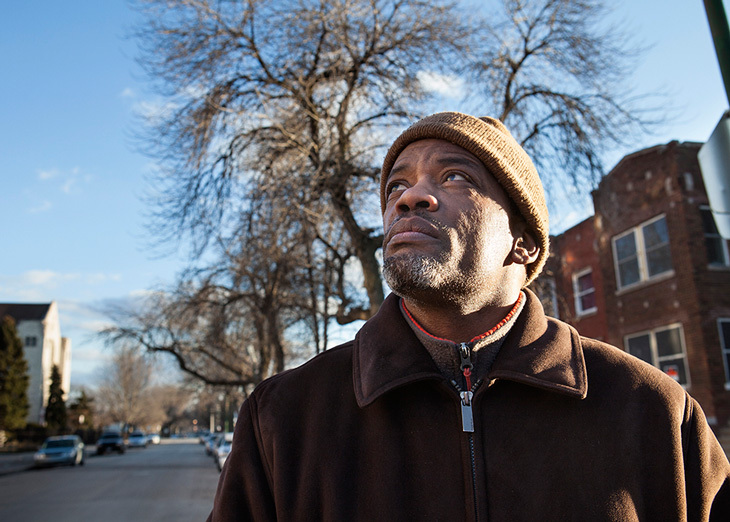 To jump-start the local housing market, he and other members of the Southwest Organizing Project decided to draw a ring around a corner of the neighborhood with the largest number of chronically vacant properties—between Western Avenue and Kedzie Boulevard, and 51st and 74th streets. Among the 100 buildings they are hoping to rehab is a boarded-up apartment building just around the corner from 6210 S. Fairfield Ave.
Jerry Peppers isn’t the oldest person on the 6200 block of South Fairfield Avenue, but he’s lived there the longest. Because of his seniority, more than his age, people refer to him as “Mr. Peppers” as a nod of respect. Peppers, a retired postal worker, moved from Englewood in 1990 when moving across Western Avenue was a big step up. His new bungalow was much sturdier than the wooden house he’d been renting, and his new street was also quieter. Peppers and his next-door neighbor, Ms. Eva, were the first black people on the block. As more people of color followed, the white homeowners “booked up,” Peppers says with a chuckle. The neighborhood had a history of racial tension, which the entire nation learned about when the Rev. Martin Luther King Jr. led an open housing march there in 1966. Hundreds of angry white people protested the march. One carried a sign that read: “King would look good with a knife in his back,” according to the Chicago Tribune. Real estate agents pandered to the fear of white homeowners and offered to buy their homes on the cheap, only to flip them at inflated prices to black and Latino families. In 1960, only three black people lived in Chicago Lawn, according to the U.S. Census Bureau. By 1990, white residents made up less than half, or 43 percent, of the population. Even as the neighborhood changed, Jackson says black people had to be careful going near Marquette Park after dusk. 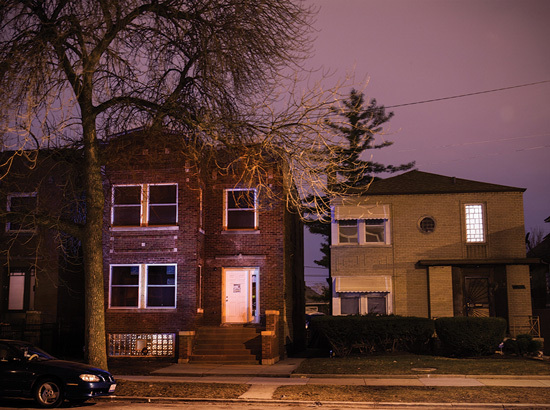 Despite the exodus of white residents, Chicago Lawn was one of the fastest-growing neighborhoods in the city until the foreclosure crisis. Between 2005 and 2008, the number of homes in foreclosure jumped from 314 to 800, according to the Institute for Housing Studies at DePaul University. Then the housing market began to spiral. 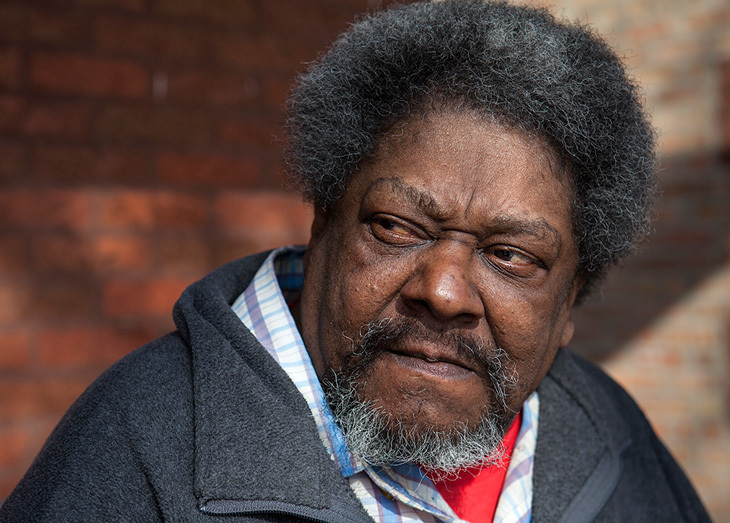 At 58, with chronic lung disease, Peppers says the upkeep of his house is too much for him. “I’d like to move,” he says, but under current housing market conditions, he doesn’t think it’s possible. It doesn’t help that Ms. Jessie’s house, which is next door, is vacant and in foreclosure court. Home values are based on what the real estate industry calls “comps” or price of comparable units in the area, which today is about half of the average outstanding loan on a house that has been foreclosed on. Peppers keeps tabs on what’s happening with Ms. Jessie’s place. He heard from another neighbor that somebody already broke in and ripped out the copper piping. Ghian Foreman, the executive director of Chicago’s Greater Southwest Development Corporation, likens the city’s vacant property problem to a forest fire. “You have to stop it fast,” he says. He points to neighborhoods on the city’s West Side where hundreds of lots have sat vacant and weed-strewn since buildings were burned down during rioting in the late 1960s. “What you cannot afford to do is wait,” he says, signaling to West Englewood, the neighborhood just a few blocks east of Chicago Lawn. 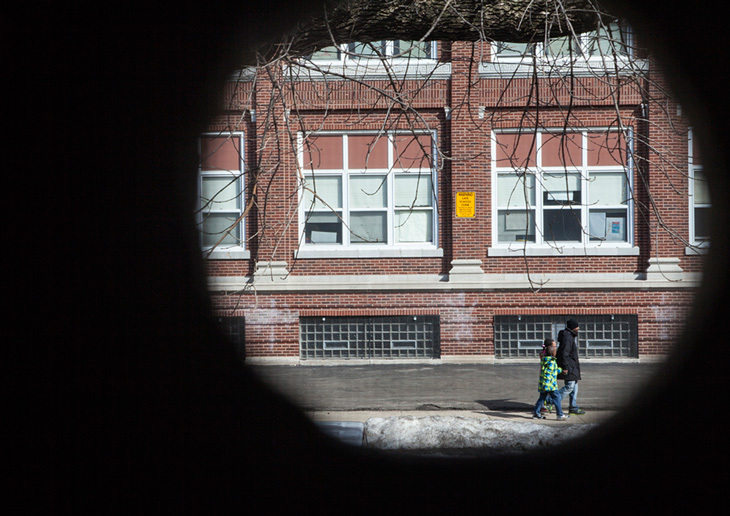 The number of empty homes and vacant lots in West Englewood seems to rival the occupied ones. How to stop blight from spreading in neighborhoods like Chicago Lawn is a question that community development experts have grappled with since the housing market collapsed six years ago. Rob Grossinger, a vice president of the nonprofit Enterprise Community Partners Inc. who oversees neighborhood stabilization programs in Chicago and across the country, says what’s happening on this small stretch of South Fairfield is often a neighborhood’s best hope for recovery. But he concedes that it isn’t exactly a systemic solution. Some suggest that City Hall should treat banks like it does other scofflaws and cut off the flow of public business when they are in violation of vacant property maintenance laws. The message from City Hall: The public needs the banks more than the banks need the public. McDowell says city officials explained that each bank has special bonding capacity, and they need to keep those relationships for future borrowing. Jim Capraro, a Chicago Lawn native who was executive director of the Greater Southwest Development Corporation for 30 years until 2010, says there are other ways that City Hall could apply pressure. According to Chicago’s Law Department, the city places liens on bank-owned properties, but it’s not an option when the bank is only managing a loan on behalf of investors. Representatives from Wells Fargo, JPMorgan Chase and Bank of America all concede that it’s easier to move vacant properties off their books when they own the loans, rather than investors. A growing number of properties held exclusively by banks are being handed over to nonprofits. The newly formed Cook County Land Bank Authority, which is the largest in the nation, will help oversee some of the donations. Cook County Commissioner Bridget Gainer says she wants to make sure banks aren’t dumping low-value properties on already distressed neighborhoods. On a recent brisk afternoon, the construction crew is putting the finishing touches on 6210 S. Fairfield Ave., almost nine months after Jackson landed the job through the Inner-City Muslim Action Network. The boards have come off the windows, and a new front door makes it look like a home again. Jackson, who has the brawn of a linebacker, looks built for construction work. He stands on a pile of dirt in the basement competing to be heard over an electric drill. The floor shakes each time a hammer whacks a new wood plank into place upstairs. The red X, which was once mounted on the building, sits next to the back door. Now, it is a keepsake and a reminder of the importance of second chances. Jackson and the other workers who have helped rehab the two-flat will be first in line for one of the two apartments. “Whoever’s house this is, it’s going to be a nice place,” he says. The facade, a hand-carved oak stairwell, a couple of support beams and some rusty hinges are the only remnants of the old building at 6210 S. Fairfield Ave.
María Inés Zamudio and Latricia Polk contributed to this story. I visited WBEZ’s Afternoon Shift today with Rami Nashashibi, executive director of the Inner-city Muslim Action Network, to talk about The Reporter’s investigation into Chicago’s vacant property epidemic. If epidemic seems too strong a word, look at this map, which shows the sheer glut — we’re talking more than 18,000 — of abandoned houses and apartment buildings scattered across the city.